Fast food giant Burger King got into the snack food business earlier this year with 2 potato snack flavors you might have seen in vending machines or your grocery store. 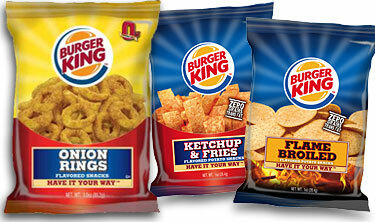 Now Burger King has announced the addition of Onion Rings to their existing line of Burger King branded Snacks. The Inventure Group is producing the BK Onion Rings snacks and also the "Ketchup & Fries Flavored Potato Snacks" and "Flame Broiled Flavored Potato Snacks" with the Burger King brand. The Onion Rings snacks remind me of Frito-Lay's Funyuns. All three branded snacks are currently available in a variety of sizes and price points in vending machines, convenience stores, warehouse clubs, drug and grocery stores. Onion Rings are available in single serving sizes of .75-ounce bags and 1.125-ounce bags in vending machines, 2-ounce bags are available in convenience stores, and 3-ounce bags are available in grocery stores. Nine and 12-ounce bags, as well as variety packs, will also be available in club stores and additional outlets this fall. "During concept testing, Onion Rings continually received high ratings from consumers," said Russ Klein, president, global marketing, strategy and innovation, Burger King Corp. "The popularity of our Onion Rings menu item translated to this new snack product. The familiar flavor profile of Onion Rings rounds out the snack line as we begin to distribute the snacks internationally." "We are thrilled with the initial success of the BURGER KING Snack launch," said Steve Sklar, senior vice president marketing, The Inventure Group. "We know that the Onion Rings will add excitement and a great tasting product to the snack line up." The .75 oz bag has 110 calories and 6 grams of fat.